I started blogging about decade ago. In the beginning, all of my write-ups were articles of my coursework in my master’s course. All too academic, can’t write without footnotes and cross-references of the books I quoted back then. It took quite a while for advertisers and other brands to come and collaborate with me, but slowly they came and never left. Now, I have to politely decline invitations and adverts not because I favour one over the other, but because sometimes it’s too much to fit in to my day’s schedule. Got few engagements this November and early December and I’m sharing with you snippets of those I hadn’t dedicated full url to. The winter adventure comes to life at SM City Davao. Disney joins SM Supermalls in bringing a magical Disney Christmas experience to select SM Malls in the country. In SM City Davao, the characters from the movie, Frozen welcome every mall-goers to a winter wonderland set in the middle of the mall. Shoppers can take pictures in the make-believe winter wonderland of Olaf and his friends. The first skating rink in Mindanao was also opened at the Annex Building with famed figure skater, Bianca Vinarao breaking the lead. The skating rink is open until January 2018. Take a look at Figure Skater, Bianca Vinarao's performance. I got invited to attend and meet few living heroes that work for Medecins Sans Frontieres (MSF) or Doctors Without Borders on November 17. This organization was a recipient of the prestigious Nobel Peace Prize in 1999. 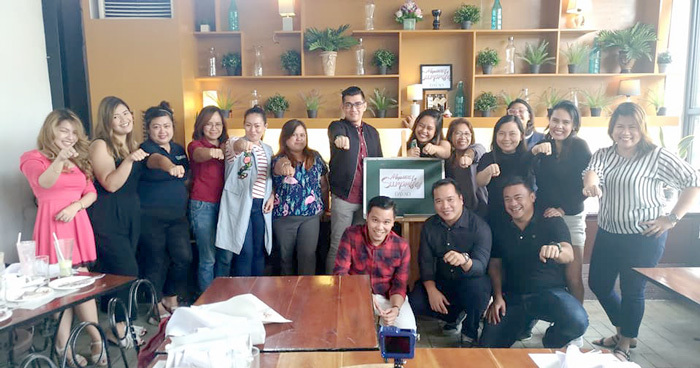 It was the first time they came to Davao and their primary mission is to share to the young people in the city the laudable mission every volunteer is undertaking in the name of humanitarian work, mostly of those done in the frontline of dangerous operations. 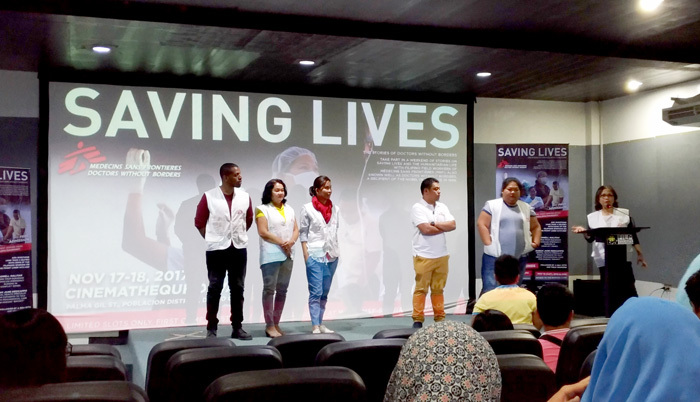 The program, which was entitled Saving Lives, gave venue to few of the Filipino volunteers to share their experiences how it’s like to be working in the war zones of Yemen, Sudan, Pakistan and how it was like to be caught in the crossfire while on the mission. Their second day in Davao was dedicated to showing Access to the Danger Zone at Cinematique Davao. It is a documentary that shows the harrowing look at the challenges of delivering humanitarian aid in armed conflicts through interviews with patients and the main humanitarian players. The film also looks at the confusion of roles with military and political actors and the compromises taken to gain access to the war zones. The documentary is first shown here in Davao City. It was a great and enriching experience meeting Pinoys that exudes positivity. That despite the oddest and hardest of situations they’re in, still manage to find a way to make their circumstances a lot lighter and funnier. Salute to all of you! The last time I was nominated to GMEA was in 2013. I think I need to sharpen my edges and send an entry next year. 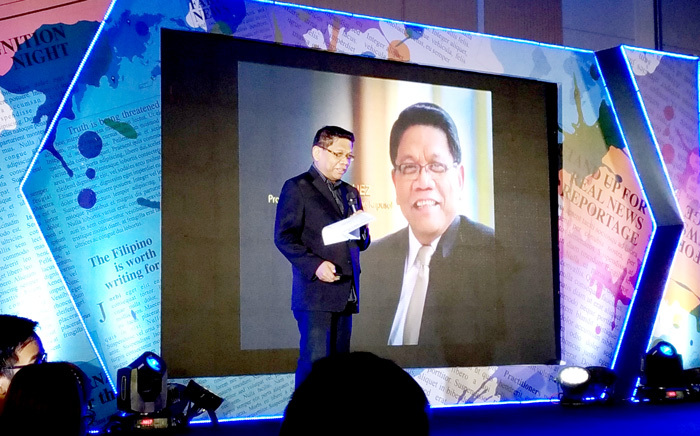 It was great seeing the iconic Mike Enriquez, who was the keynote speaker, in the flesh. Wala pong pinagkaiba, mga kapuso! 😛 Thanks for inspiring the stakeholders of the fourth estate on this part of the country, Sir! Congratulations to the winners of GMEA 2017. The Media | Bloggers Appreciation Party followed after the announcement of the winners. Davao Digital Influencers took home the second prize for the dance competition. Thank you, Globe for the great night! It was great seeing the same happy faces again on this party. I’m not playing preferences, I’m a subscriber of both Globe and Smart. You know how it’s like these days when it pertains to telcos, having the best of both worlds is necessary to a blissful and hassle-free digital life. I have to commend you Smart, it was really smart to have those stand-up comedians running the floor. God, I’ve never laughed so hard from the beginning to the end of any party I’ve been to lately, thanks Smart Communications for bringing in those awesome Drag Queens, they truly made my night. It was truly a great night with a great laugh. Lady Morgana performing. Thank you for the great night! Davao’s Home-grown mall, NCCC celebrated its 39th anniversary on December 1, 2017. There were various activities happening in all NCCC malls in Mindanao during the anniversary date – Free Medical Services, Entertainment extravaganza with various artists performing to entertain mall-goers. The internet voice sensation, Moira Dela Torre also came to take part in the celebration. Rock bottom Sale on various great pieces of up to 70% was enjoyed by mall goers from December 1-3, 2017. Highlight of the event was the meet and greet of NCCC’s Ambassadress, Davao City Mayor Inday Sara Duterte-Carpio. She dropped by addressed the media and even joined us for lunch. Congratulations, NCCC on your 39th anniversary! shares holiday shopping tips to Davaoenos. Davao Digital Influencers, in which I'm a part of, meet over lunch the public relations and media affairs execs of Megaworld Corporation. We get to have a clear picture of the corporation’s projects and future projects in this part of the country. Thank you, Megaworld for the early Christmas gift and looking forward to great possibilities of collaboration in the future. Jen Ambanta, Media Relations Manager and MJ De Leon. And that’s it for now. I’ve left all other dates vacant this December as I’m wrapping up other significant assignments that’s necessary for my financial liquidity. You know, ‘hanapbuhay’. To all my foreign direct advertisers, brands, companies, organizations who trusted woman-elanvital.com, thank you so much! Looking forward to a more fruitful partnership come 2018!